The UN chief made the appeal in a speech to the General Assembly in New York on Tuesday, ahead of the International Day for the Elimination of Racial Discrimination. “It is time all nations and all people live up to the words of the Universal Declaration of Human Rights, which recognizes the inherent dignity and equal and inalienable rights of all members of the human race,” he stated. Mr. Guterres said while there has been progress since the Declaration’s adoption 70 years ago – for example, in the advancement of the rights of women, children, indigenous people and persons with disabilities – there is still far to go in ending discriminatory attitudes, actions and practices. He listed pressing issues such as gender inequality; the “alarming rise” in xenophobia, racism and intolerance, and a resurgence in far-right political parties and neo-Nazi viewpoints. “So, on this International Day, let us all consider how we can better promote tolerance, inclusion and respect for diversity in all nations and among all communities,” the UN chief said. Like the Secretary-General, the UN High Commissioner for Human Rights also looked to the landmark Declaration in his address to the gathering. Zeid Ra’ad Al Hussein highlighted how discrimination against individuals affects society as a whole. “The Universal Declaration of Human Rights warns very clearly that if rights are not protected, conflict may follow,” he said. It commemorates the lives of 69 people killed during a peaceful demonstration in Sharpeville, South Africa, on that day in 1960. 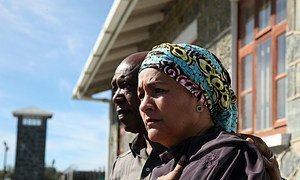 As the UN chief pointed out, apartheid “was ultimately – and thankfully – consigned to history” after Nelson Mandela was released from prison and later ascended to the presidency. Mr. Mandela, who died in 2013, was the first democratically-elected president of South Africa and the country’s first black head of state. “A stark and tragic example lies in the egregious treatment of Rohingya Muslims in Myanmar,” he said, referring to the ethnic minority community whose members have been fleeing to Bangladesh by the thousands to escape persecution. 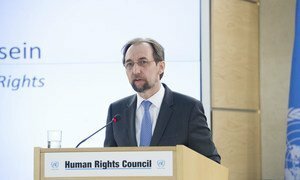 In a scathing address to the Human Rights Council, the top United Nations rights official on Wednesday warned political leaders who stoke fear and intolerance among their followers for the sake of their own ambitions are merely copying the behaviour of previous generations of once strong, but ultimately catastrophic, leaders and politicians.